There is no doubt about, Accrington are flying, absolutely flying. Few would have given John Coleman’s side a realistic chance of automatic promotion this season, but they have firmly shoved the bookies tag of relegation favourites with a simply superb run of form. Prior to Christmas, Stanley might have been worried about even making it into the play-offs as they lost four league games in a row, sitting in ninth place, some 14 points behind Luton. However, a 3-0 win at Grimsby started something special for the Reds as it now seems that a top seven finish would be viewed as a bit of disappointment this term. Tuesday night’s 1-0 win over Morecambe, coming from yet another Billy Kee penalty, means that Stanley have won 10 out of their last 12 league matches, and if they can make it 11 on Saturday, it will see them leapfrog Luton to the League Two summit. They’ve kept four clean sheets out of five in that time, although Stanley do have an incredibly tough run-in ahead, playing all the top nine bar Coventry in their remaining 11 matches. Rather than shy away from the fact that they could go top on Saturday, it’s something Coleman is clearly relishing, as should they beat Luton, it would take the club to their highest league position since reforming in 1968. He told the club’s official website: “I would love to win the title but if we beat Luton and go top, it’s just another three points, we haven’t won anything. “People might get carried away but we certainly won’t. All I am concerned about is being in the top three after the final day of the season, that’s what counts. “It doesn’t surprise me that the gap has been closed as this league is so even. Any team can beat another on their day, as has been proved. “Luton are top of the league for a reason, they have scored a lot of goals, they have a huge goal difference and they have been the most consistent team in the league. “They have been up at the top to be shot at for a long time and they have kept it going. They have good players, a big fan base and are a big club. Stanley’s form was enough for the Reds boss to be named manager of the month, as February saw his side win five out of six, only held to a surprising 1-1 draw by bottom side Barnet. On the honour, Coleman added: “It’s obviously about the team and the Manager of the Month award should go to the team. “Saying that if I win it in either of the next two months it should mean we are going up so I will be more than happy to accept it in March or April! Team news: Luton are without suspended striker James Collins after he was sent off against Cambridge last weekend. Lawson D’Ath is also out with medial ligament damage suffered in the game. Top scorers: Hatters: Danny Hylton and James Collins (17). Stanley: Billy Kee (21). Milestones: Johnny Mullins will make his 50th appearance if he features against Accrington this weekend. Man in the middle: Darren Drysdale - has refereed 37 games so far this season, with 100 yellows and five reds as he took Luton’s 4-0 win over West Ham U21s in the Checkatatrade Trophy back in December. Last term, he had the whistle for Town’s 1-1 draw at home to Plymouth, while in the 2014-15 campaign, refereed the 2-0 defeat at Portsmouth and 3-0 home win over Newport County. Prior to that, he took Luton’s 2-0 FA Cup win at Brentford in 2007 when Chris Coyne and Jaroslaw Fojut netted. Also refereed Town’s 5-1 hammering at Preston in the Championship in 2006, sending off goalkeeper Marlon Berefdord in the last minute, plus the 3-0 home win over Stockport in 2005, with Coyne again, plus Steve Howard and Kevin Nicholls on target. Assistant referees are Lisa Rashid and David Plowright with the fourth official Rob Smith. In charge: John Coleman - 55-year-old who had a lengthy playing career for a host of sides including Kirkby Town, Southport, Macclesfield Town and Morecambe, plus a spell in Wales. One of the most prolific non-league goalscorers in history, with over 500 goals to his name over two decades, he became Ashton United player boss in 1997, moving to Accrington two years later. Spent over 12 years in charge at Stanley, leading them to three promotions, including a place in the Football League in 2006 until he left to join Rochdale in January 2012. Had his contract terminated just before completing 12 months in charge at Spotland, but was back in management for a short spell with Southport and then took over at Sligo Rovers in June 2014. Returned to Stanley for his second spell in September 2014 and is now the 12th longest serving manager in the top four divisions. View from the opposition: On-loan Burnley defender Jimmy Dunne talking to the club’s official website: “We’ve set things up perfectly with that win (over Morecambe), we go there on Saturday, and for me, it could be the biggest game we will play this season. “We need to take that same attitude into Saturday, press them from the front, like we have been doing so well, and we’ll give ourselves a very good chance. Friendly faces: Hatters defender Lloyd Jones spent two months at Accrington on loan from Liverpool towards the end of the 2014-15 season. Featured 11 times for Stanley, scoring one goal, that coming in the 1-1 draw at Morecambe in April. Played for both: Harold Andrews - an inside left, centre forward or left half, he started his playing career with Lincoln City in 1925, moving to Notts County, Barnsley and then the Hatters in 1935. Made just the one appearance for Town, that a 2-1 home defeat to Southend in the old Division Three South in front of 14,379, Jack Ball on target for the hosts. From Luton, headed to Accrington in 1936, playing 65 times, scoring twice as he finished his career with 140 goals from 385 games. One to watch: Billy Kee - Striker who started his career as youngster with Leicester before a loan move to Accrington in July 2009 where he scored nine goals. Spells at Torquay, Burton, Scunthorpe and Mansfield followed, before he rejoined Accrington in June 2015. Managed 17 goals in his first season and then 15 last term, but is currently enjoying his most prolific campaign to date, starting with three in his first four matches and reached double figures by mid-October. We’ve got form: Luton have a mixed record in their short history against Accington at Kenilworth Road. They lost their first ever meeting 2-1 back in October 2008, with the visitors were ahead through Paul Mullin’s 16th minute strike, before Asa Hall levelled for Town, only for Terry Gornell to seal victory. Luton did win 2-0 in the 2014-15 season with goals from Jayden Stockley and Luke Guttridge, before another loss, 2-0 followed the campaign afterwards, until Hatters restored the balance with last year’s triumph. Last time out: Luton ground out a 1-0 win over Accrington at Kenilworth Road last season. 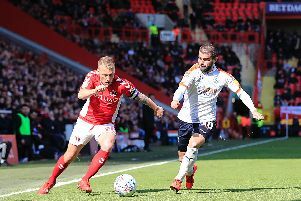 It looked like the Hatters would be frustrated until Cameron McGeehan scored the only goal of the game in the 75th minute, although they had to play the final stages with 10 men after Jordan Cook was sent off for his second yellow card. Hatters: Christian Walton, James Justin, Alan Sheehan, Scott Cuthbert, Glen Rea, Cameron McGeehan, Jordan Cook, Alex Gilliead (Jonathan Smith 87), Olly Lee (Johnny Mullins 89), Danny Hylton, Jack Marriott (Isaac Vassell 66). Subs not used: Craig King, Stephen O’Donnell, Jake Gray, Craig Mackail-Smith.